Huntsville's walk has really grown over the years - to the point organizers had to relocate from the botanical gardens to the Village of Providence. About 1,000 people took part this time. There has been progress in fighting the disease, but there's a long way to go. The goals here are to raise funds and awareness for the cause. Katie Weir's mother, Judy Maddox, has MS.
"She's had it about 12 years," Weir said. "And about three years ago, she was put in a wheelchair." Weir coaches the James Clemens High School dance team, which raised $1,000 during the walk. The disease damages the spine, brain and nerves. Weir says she would love to see advancements made that allow her mom to get back some of what she's lost. "To find some kind of treatment that can help those nerves where they can get at least some of that function back," Weir said. 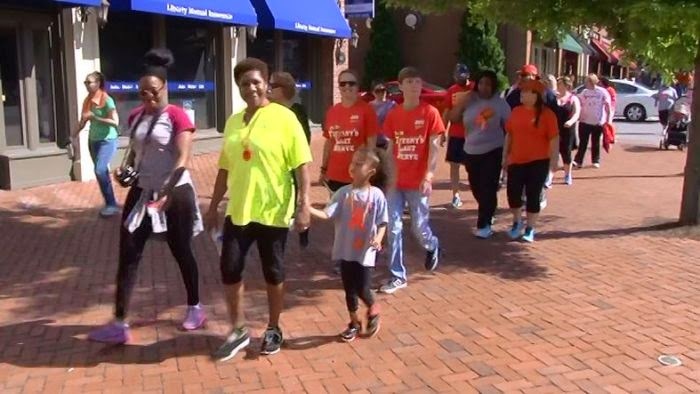 Yolanda Moore had a team walking with and for her, and she walked for others she knows who, like her, have MS.